I spent a peaceful day at home for Christmas. Both of our children are living out west and my husband and I chose to stay home for the day with a simple dinner. As a result, I got to focus on my sewing for the entire day. What a luxury! For a start, I watched a DVD on fusing by Laura Wasilowski, Fused Art Quilts. I found Laura to be a great teacher. Her DVD is very professionally produced and she even sings a song during it! 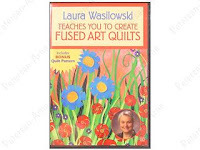 Laura covers all the basics that one needs to create a fused art quilt and at the end she illustrates what she has taught in a simple project. If you have been following my blog, you know that I have been exploring different approaches to fusing, particularly after a disappointing result a few weeks ago. While my art quilts are a bit of a different style than Laura's, I still picked up quite a few tips that I will apply in my own projects. It is always helpful to see how others approach a goal, particularly when things are so meticulously taught. I spent part of the rest of the day on a flower piece that has been on my design wall for a few weeks and which gave me a chance to experiment with the free motion quilting settings on my new machine. This is one of those projects that disappointed me. My basic criticism of it is the heavy look of the petals. In retropsect, I should have shaped the petals more instinctively. The flower came from a photo and I got too caught up in following the lines of the photo. I also had issues with the center of the flower while I was working on the piece. The center that you see is actually a second try. I never had a really good handle on how I wanted to create the center and the first attempt really didn't work for me. I had some fabric that resembled some of what I had wanted to create so I wound up cutting a piece of that and putting it over the original center - persistence on my part. So, that is what I didn't like about my dear flower. How about the positive? 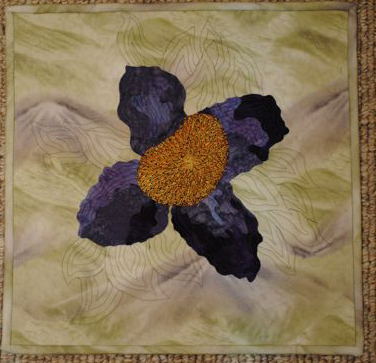 I like the colors in the petals - it was one of my first attempts at creatng petal shading through piecing. And, I like my free motion quilting - particularly the leaf effect around the petals. It is the first time I have tried for that sort of an effect and I can see that I have going to use it in future projects.